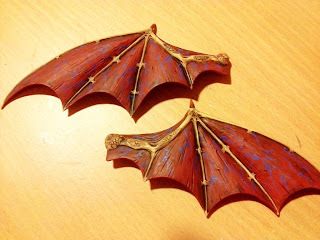 Back to my second pair of Flyrant wings. I've added some veins again. I find a cocktails stick is handy for this as you can roll the stick to get areas of thick and fine paint, much as you do veins. 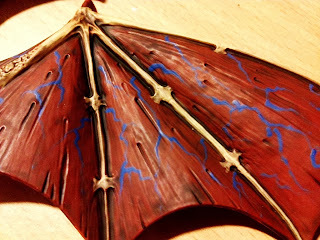 I'll be adding some lighter highlights at the junctions and then be overpainting them with more red highlights to give the impression the veins are 'sub-dermal'. It's amazing how similar these look to my original wings, although the pictures are a little misleading. 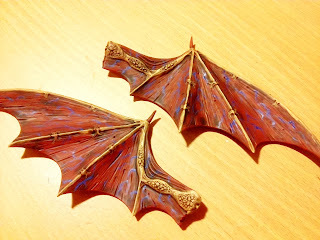 Due to the red oxide primer base these wings are a lot darker than the original wings. I'll do a straight up comparison at a later date. At least I don't have the crusty deposit of Seraphim Sepi as you can see in these old pics of the originals. However you can see that by starting with a Bonewhite base and then adding thinned Mechrite red and both sepia and mud washes I was able to get many tints in the wings making it quite 'membranous' something that was my intention but slightly lost on the new ones, they look practically rigid but they do match the old Forgeworld Shrike Wings, form what I've seen, so that's not too bad. 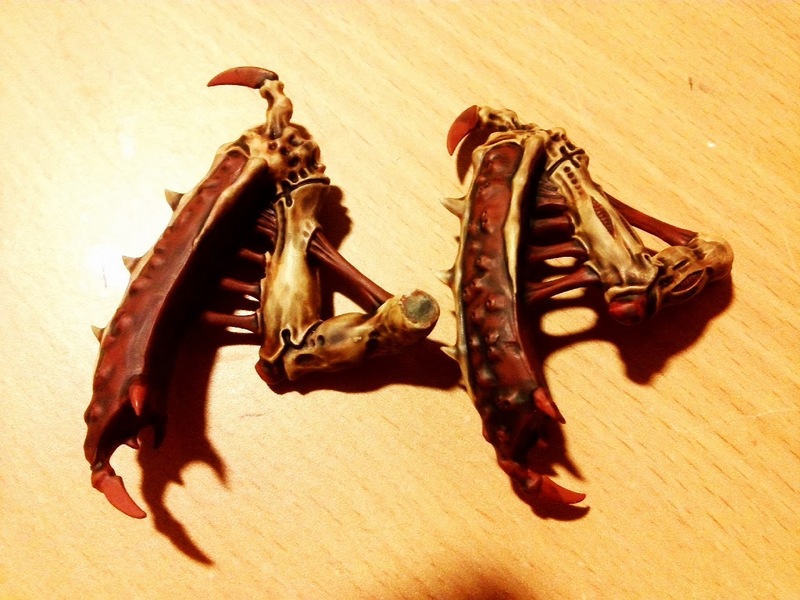 And the Devourers have had a nice wash too. Lets hope those playtest rumours don't hold true for the Hive Tyrant and they can no longer take them. It would be a real kick in the balls for all those who've made them only to no longer get the de-facto Flyrant build. 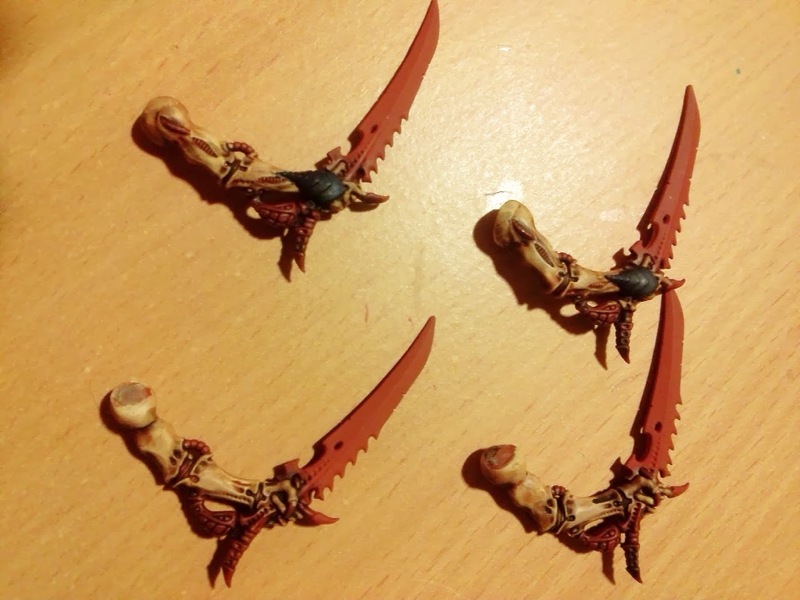 The Big question is what colour do I do the blades for the Swarmlord? As you can see my Boneswords currently have a glossy crystalline look that uses black and turquoise. However, this is the Swarmlord so would an alternative colour work? Particularly as his Bonesabres are so unique. I know I can do some really nice effects with the green and red but the green may be 'yet another colour' and the red may be lost in the base but what do you think? Cheers Grim Darkness your input is noted, we'll see how I'm feeling on the day I take the plunge. There will be much wailing and gnashing of teeth if Tyranid players lose dual devs on tyrants. But if you want to force players to buy new models... I wouldn't put it past GW. I agree, been using two Winged Tyrants in my last few games and they're just brutal and the versatility in having the option to vector strike and still get 6 St6 twin linked shots on what may have spilled out of the thing you just mauled. Lets just imagine the next Chaos Codex and the Heldrake losing it's Baleflamer - it's that big a deal! Just found your blog; it's great! As a fellow swarm commander that has tried to change color schemes for special characters' weapons, I feel like it just didn't come across as well. My suggestion is to stick to the black and turquoise, but highlight the turquoise parts up to almost white in the innermost parts. That will make them look like they're crackling with power! Cheers Arnie, glad you've found us, hope you like what's here. Black and turquoise is my standard at the moment, we'll just have to see how I'm feeling come decision day.